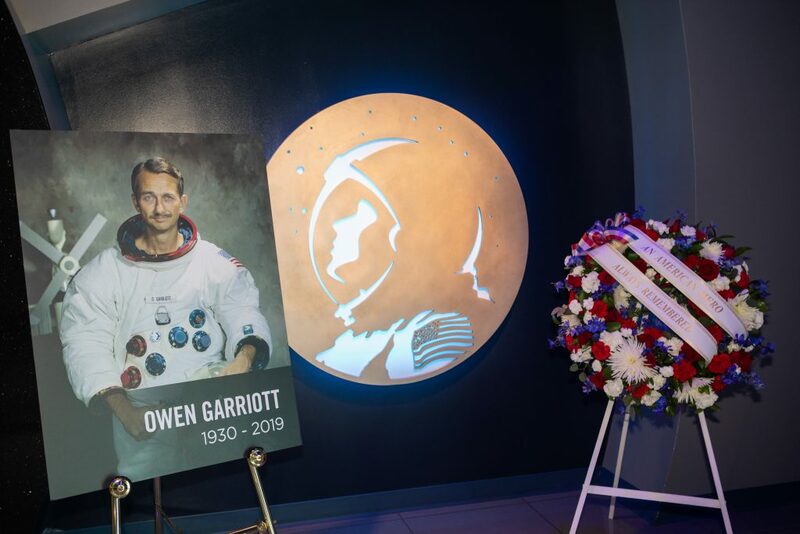 NASA astronaut Owen Garriott, a veteran of two spaceflights, was remembered by Kennedy Space Center officials and employees during a ceremony at the Florida spaceport’s visitor complex on April 18, 2019. Following the ceremony, a memorial wreath was placed in the Heroes and Legends exhibit within the Astronaut Hall of Fame. Garriott passed away on April 15, 2019, at the age of 88. Speakers at the ceremony included Center Director Bob Cabana and Therrin Protze, chief operating officer at the Kennedy visitor complex. Also sharing a few words was former NASA astronaut Jon McBride. 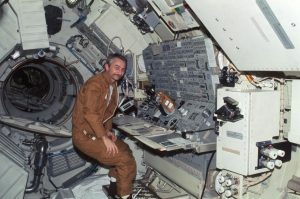 Garriott was selected as one of the first six NASA scientist-astronauts in June 1965. He flew aboard the Skylab space station during the Skylab 3 mission, serving as the mission’s science-pilot, and also on space shuttle Columbia during the STS-9/Spacelab-1 mission. This ninth space shuttle mission contained a crew of six – the largest to fly aboard a single spacecraft at the time. It also was the first international shuttle crew and the first to carry payload specialists. Born in Enid, Oklahoma, Garriott received a bachelor’s degree in electrical engineering from the University of Oklahoma. He then went on to receive a master’s and doctoral degree in electrical engineering from Stanford University in Palo Alto, California. In 2011, Garriott was inducted into the U.S. Astronaut Hall of Fame at Kennedy’s visitor complex. 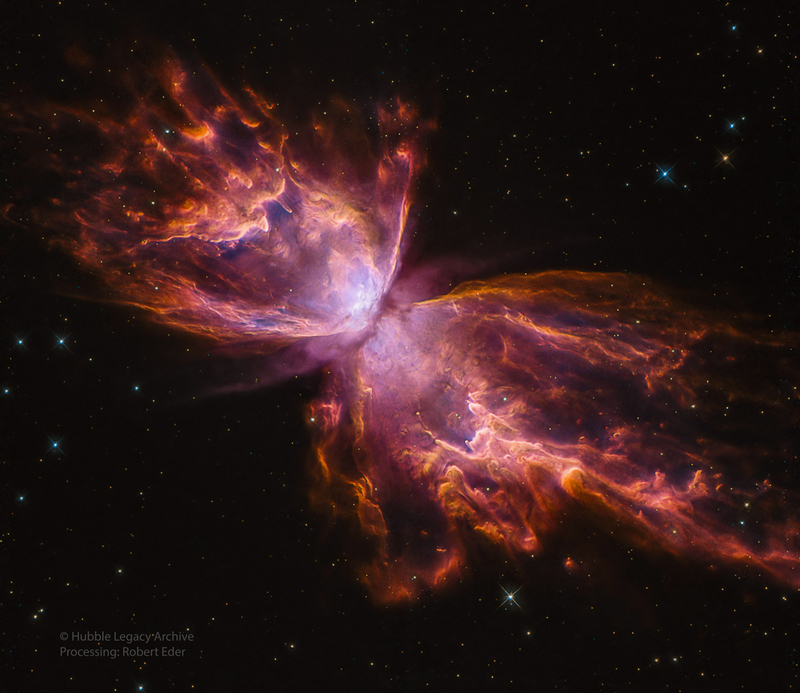 Learn more about Owen Garriott. Each year, NASA Kennedy Space Center’s Safety and Health Days demonstrates how this topic is not only a top priority both centerwide and agencywide, but that it’s ingrained in the spaceport’s DNA. This year’s Safety and Health Days took place March 25 – 29. Events and presentations held during the week emphasized the importance Kennedy places on the wellbeing of its employees, both at home and at work. A few of the classes and presentations open to employees included: “Stop the Bleed,” a hands-on course that teaches basic life-saving interventions to equip individuals with the knowledge and power to act quickly and save lives; “Moments Matter,” where a flight crash survivor revealed how resiliency, leadership and managing your mind can help you overcome obstacles to grow and thrive; and a briefing on the “Space Launch System Low Oxygen Tank Mishap,” in which a team of investigators delved into the cause of the incident and discussed recommendations and corrective actions that have helped to prevent future incidents at Kennedy. Also available for employees were presentations on how to determine if they are getting a good night’s sleep, the seriousness of skin cancer and what to look for, the Crimeline, safety awareness, crime prevention and education program, presented by Brevard County’s well-known Sheriff Wayne Ivey, and the importance of safe behaviors at home and at work. In addition to presentations, Kennedy and Cape Canaveral Air Force Station employees had the opportunity to attend the KSC Walk Run on Tuesday, March 26. 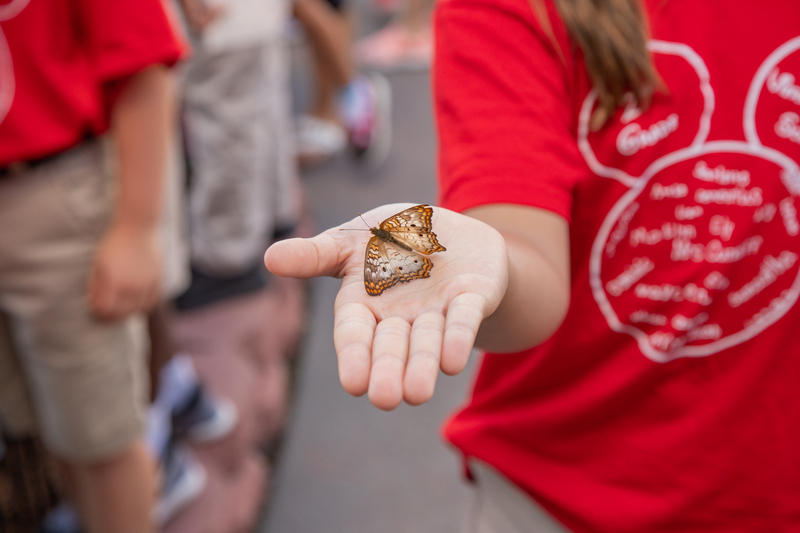 Employees and up to four of their registered guests were able to participate in a two-mile walk or run, a 5K run, or a 10K run. The Tour de KSC, a bike tour on Kennedy grounds open to employees and up to five guests per employee, is another event employees were encouraged to attend. 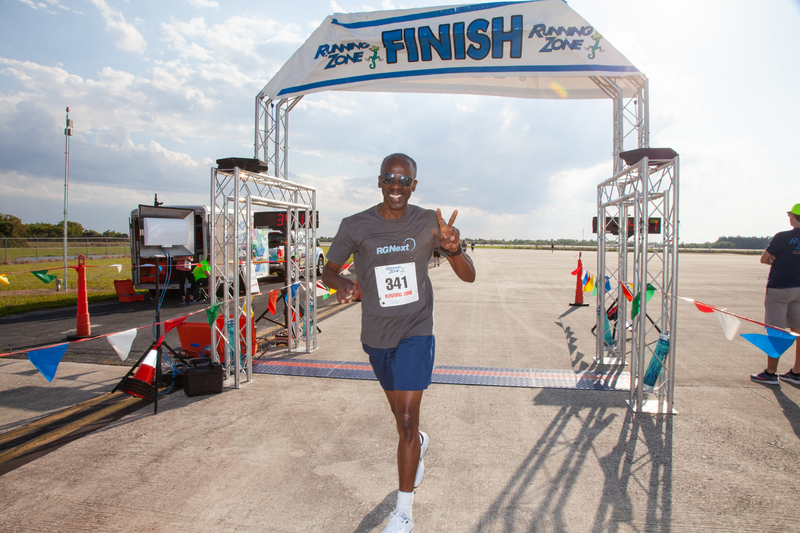 Originating in 2009, the Tour de KSC is another way the spaceport promotes an active lifestyle and a healthy work-life balance. This year’s tour took place Saturday, March 30, with attendees riding alongside Center Director Bob Cabana, an avid bicyclist. In addition to the presentations and events that took place during the week, Kennedy offers year-round fitness center and balance zone classes every week, giving employees the opportunity to improve and maintain their health throughout the year. The activities and information readily available to all employees reinforce the notion that health and safety continues to be a hallmark of Kennedy’s values — not only during this week, but throughout the entire year. The SpaceX Crew Dragon continues to perform well as the Demo-1 flight test nears completion. The Crew Dragon hatch will be closed Thursday, March 7, at approximately 12:25 p.m. EST. 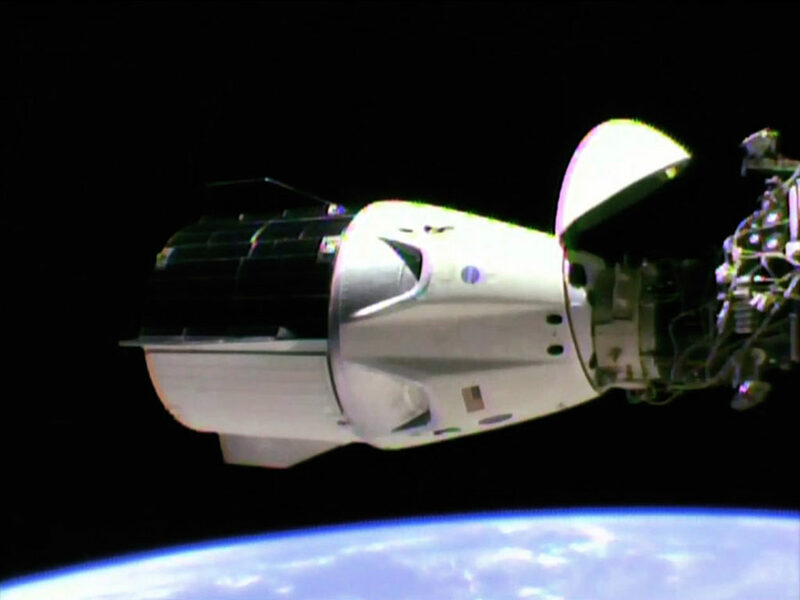 Crew Dragon will remain docked to the International Space Station until approximately 2:30 a.m. on Friday, March 8. The spacecraft is expected to return to Earth hours later, with a splashdown in the Atlantic Ocean at approximately 8:45 a.m.